The importance of information radiators and informative workspace is unquestioned in Agile. Scrum and XP have enough visual indicators like whiteboards, flip charts, burndown charts, build status lamps etc. so that the information is highlighted as soon as it is gathered for easy consumption. Michael Hunger and Takeshi Kakeda take this idea a bit further by using Lego blocks to track time spent on various projects and bug tracking. According to them it is both effective and fun. Michael Hunger discovered the Lego way of time tracking when he was trying to find a solution for visually depicting and planning the time spent on various projects in a week. Michael represented each column on the base as a ruler on which he could stack the hours. He represented each hour as an aggregation of 4 studs of Lego, each stud representing quarter of an hour. So if the first hour was spent on 2 projects then it would have 2 studs of 2 colors on the first row. Each project is represented with a different color. 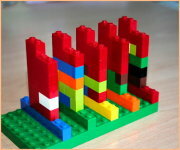 On similar lines Takeshi Kakeda presented about the use of Lego blocks in doing effective bug tracking at Agile 2008.The bugs were represented as Lego blocks on the board with priority being represented horizontally, dependency between bugs represented by stacking them vertically and the difficulty represented by the shape. Some of the benefits that Takeshi observed were that bugs were intuitively visible and mindset of the developers changed from negative to positive. Also, given the physical constraint of the board on which bugs could be placed new bugs could not be added unless the earlier ones were resolved, thus making it necessary to resolve existing bugs faster. Thus use of Lego blocks has gone further from just being present in a kids play basket to being used as effective information radiator in the Agile environment. Gotta hand it to Michael and Takeshi - they've taken the mundane task of Time Tracking and made it fun again. I like Michael's one drawback: co-workers coming along, assuming the legos are to play with, and then destroy your weeks work in one fell swoop. Legos haven't been for kids since they came out with the first Mindstorm kit... You could apply this to any real world set of objects though. I wouldn't use M&Ms though. A side note... is it common for others to track tasks down to 1/4 hr? Thanks for mentioning this on infoq. We even continued our journey into LegoLand. The next things I plan are integrating a webcam into the time tracking board for automatic recording of the brick columns (similar things (but oriented in the wrong direction have been build by databrick.de. The next great thing (tm) is printing onto lego bricks. I was looking for ways to increase the available colors for the time tracking (especially when extended to task tracking on agile projects). So my neighbor Mattcher and me came to the conclusion that just printing onto lego walls is the solution. See this blog entry for first impressions. Regarding the quarter hour question. My current client requires all his contributors to track the time at that level. So thats not necessarily my choice (besides if you have a half hour task which crosses the hour boundary you still need to break it up for display in the two rows). Perhaps the comments on lifehacker on lego time tracking are also of interest. 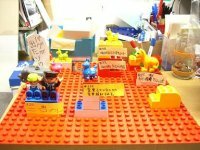 I learned that Lego Group has a business consultancy company that is called Lego Serious play. Teams new to agile planning sometimes break work into very small tasks in order to understand what needs to be done. Once they understand it, usually relatively soon, they tend to roll several small tasks up into larger ones, or even estimate at the story level. A mature team could probably eliminate some waste by estimating at a larger granularity. If they say they cannot, I'd see a red flag and look for too much multitasking.